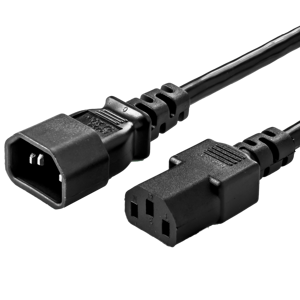 15A IEC60320 C13 C14 Power Cords - 14AWG | World Cord Sets, Inc.
15A IEC 60320 C14 to C13 Jumper Cords are the "Heavy Duty" version of the 10A C14-C13. With thicker 14AWG cordage, it can handle currents up to 15A. The standard Rack Mount PDU has C13 outlets, which mate with the C14 plug on this jumper cord. Most servers, routers, switches, etc have C14 inlets on the PSU's (Power Supply Units) which mate with the C13 female connector on this jumper cord. Coming in a variety of colors, data centers typically choose a RED power cord for the primary power supply and a BLUE Power cord for the secondary power supply. This allows for easy identification of the primary and secondary power sources and reduces server downtime by decreasing accidental power failure. We offer Black, Blue, Gray, Green, Orange, Pink, Purple, Red, White, and Yellow colors to suite your specific color code. We stock several standard lengths ranging from 1' to 20'. Standard wire gauge is 14AWG. For other cordages, ampere ratings, angles, and colors, please see our main C14 to C13 Power Cords page. IEC 60320 C14 to C13 15 amps 250 volts (aka C13 to C14) Black Power Cords. Cordage is 14awg SJT (in some cases the jacket may be SJTO, SJTOW, SJTOOW or other). Approvals / Certifications are UL, cUL, RoHS. Also available in white, gray, blue, green, red, yellow, and orange by clicking on the desired color below. C14 C13 Power Cords are typically used in data center and IT installations to connect a PDU to a SERVER/COMPUTER. Also used for network switches, routers, and other computing/networking equipment. Commonly referred to as a 'c14 c13 jumper cable'. BLUE 15A 250V C13 C14 Power Cords. IEC 60320 Standard. Computer, PDU, Data Center applications. 15A SJT C14 C13 Power Cables are a heavy duty power cord, used with high powered equipment or for long cables to compensate for line loss. 15A C14 C13 power cables are 14awg with three wires, rated up to 250 volts. Visit out IEC 60320 Reference Page for more information on the different plugs and connectors in the IEC 320 standard. GRAY 15A 250V C13 C14 Power Cords. IEC 60320 Standard. Computer, PDU, Data Center applications. 15A SJT C14 C13 Power Cables are a heavy duty power cord, used with high powered equipment or for long cables to compensate for line loss. 15A C14 C13 power cables are 14awg with three wires, rated up to 250 volts. Visit out IEC 60320 Reference Page for more information on the different plugs and connectors in the IEC 320 standard. GREEN 15A 250V C13 C14 Power Cords. IEC 60320 Standard. Computer, PDU, Data Center applications. 15A SJT C14 C13 Power Cables are a heavy duty power cord, used with high powered equipment or for long cables to compensate for line loss. 15A C14 C13 power cables are 14awg with three wires, rated up to 250 volts. Visit out IEC 60320 Reference Page for more information on the different plugs and connectors in the IEC 320 standard. ORANGE 15A 250V C13 C14 Power Cords. IEC 60320 Standard. Computer, PDU, Data Center applications. 15A SJT C14 C13 Power Cables are a heavy duty power cord, used with high powered equipment or for long cables to compensate for line loss. 15A C14 C13 power cables are 14awg with three wires, rated up to 250 volts. Visit out IEC 60320 Reference Page for more information on the different plugs and connectors in the IEC 320 standard. PINK 15A 250V C13 C14 Power Cords. IEC 60320 Standard. Computer, PDU, Data Center applications. 15A SJT C14 C13 Power Cables are a heavy duty power cord, used with high powered equipment or for long cables to compensate for line loss. 15A C14 C13 power cables are 14awg with three wires, rated up to 250 volts. Visit out IEC 60320 Reference Page for more information on the different plugs and connectors in the IEC 320 standard. PURPLE 15A 250V C13 C14 Power Cords. IEC 60320 Standard. Computer, PDU, Data Center applications. 15A SJT C14 C13 Power Cables are a heavy duty power cord, used with high powered equipment or for long cables to compensate for line loss. 15A C14 C13 power cables are 14awg with three wires, rated up to 250 volts. Visit out IEC 60320 Reference Page for more information on the different plugs and connectors in the IEC 320 standard. RED 15A 250V C13 C14 Power Cords. IEC 60320 Standard. Computer, PDU, Data Center applications. 15A SJT C14 C13 Power Cables are a heavy duty power cord, used with high powered equipment or for long cables to compensate for line loss. 15A C14 C13 power cables are 14awg with three wires, rated up to 250 volts. Visit out IEC 60320 Reference Page for more information on the different plugs and connectors in the IEC 320 standard. WHITE 15A 250V C13 C14 Power Cords. IEC 60320 Standard. Computer, PDU, Data Center applications. 15A SJT C14 C13 Power Cables are a heavy duty power cord, used with high powered equipment or for long cables to compensate for line loss. 15A C14 C13 power cables are 14awg with three wires, rated up to 250 volts. Visit out IEC 60320 Reference Page for more information on the different plugs and connectors in the IEC 320 standard. YELLOW 15A 250V C13 C14 Power Cords. IEC 60320 Standard. Computer, PDU, Data Center applications. 15A SJT C14 C13 Power Cables are a heavy duty power cord, used with high powered equipment or for long cables to compensate for line loss. 15A C14 C13 power cables are 14awg with three wires, rated up to 250 volts. Visit out IEC 60320 Reference Page for more information on the different plugs and connectors in the IEC 320 standard. Our 15A C14 to C13 power cord sets feature 14awg conductors inside a robust SJT outer jacket. 14awg C14 to C13 Cord Sets are the heaviest duty, highest amperage C14-C13 configuration available due to the max rating of both the C14 male plug and C13 female connector being 15A. 14awg C14-C13 power cords are recommended if you are unsure of how much current you device uses, or, if you are simply looking for the heaviest duty power cord. 15A C14 C13 power cords are not recommended for use in high density data centers that do not require 15A due to the size of the conductors significantly increase the Outer Diameter (OD) of the cordage, therefore reducing airflow inside of the cabinet. C14-C13 power cords are used for two primary functions. In Data Centers, these cord sets, also referred to as "jumper cords" are used to connect a Power Distribution Unit to a Server, Router, Switch, or other IT device. Typically the PDU is mounted vertically on the side of the rack to provide outlets as close as possible to each unit. For this reason, the most common lengths found at 3FT and 6FT. In Data Centers with redundant and separate circuits, color coded 15A power cords to easily identify which circuit the cord set (and therefore the device that it is attached to) is a part of to each troubleshoot disconnections and power path issues. The IEC 60320 C14 is a grounded 3 Wire Plug rated up to 250V and 15 Amps. The C14 mates with a C13 outlet, typically found on Data Center/IT specific PDUs (Power Distribution Unit). The IEC 60320 C14 is typically used with either 18awg SVT, 18awg SJT(OW), 16awg SJT(OW) or 14awg SJT(OW). The types of cordages used will change the rating of the overall cord set. See below for the application of using a C14-C13 Power Cord from World Cord Sets to connect a C13 outlet on a PDU to a C14 inlet on an HPE Proliant Server. Rack Mounted PDUs are the standard way to distribute power to many devices in a rack. WoCo C14 C13 power cables mate perfectly will all brands of PDU including APC, Raritan, Server Technology and more. The C14 plug on this power cable will mate with any C13 Outlet. The standard C14 does not feature a locking mechanism. The C13 connector will mate with a matching C14 inlet, typically found on servers, routers, switches, and your standard desktop computer. Many small appliances use a C14 inlet to provide power to the PSU (Power Supply Unit). Our C13 connectors will mate with any C14 inlet on your small appliance.